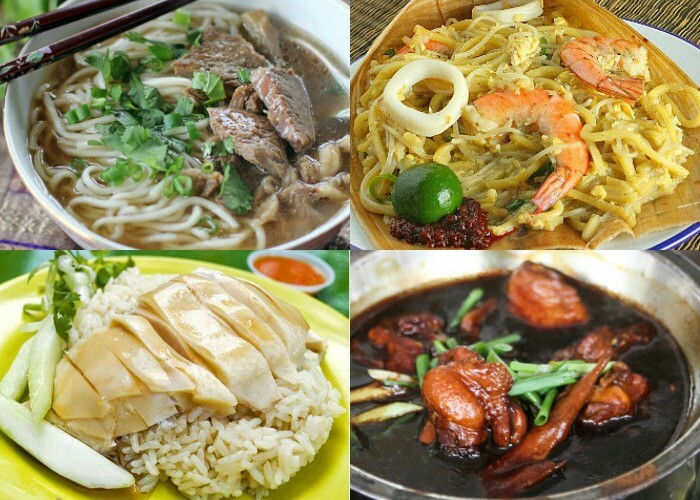 Singaporeans in the CBD have an enviable range of food option. Compared to what is served at business parks, what we enjoy in the central districts are a veritable banquet. And so a group of sympathetic Singaporeans decided to do something about it. Nope, they’re not related to honestbee, neither are they a grocery delivery startup. Instead, the NTUitive-backed startup delivers mouthwatering hawker meals to the food-deprived business parks. 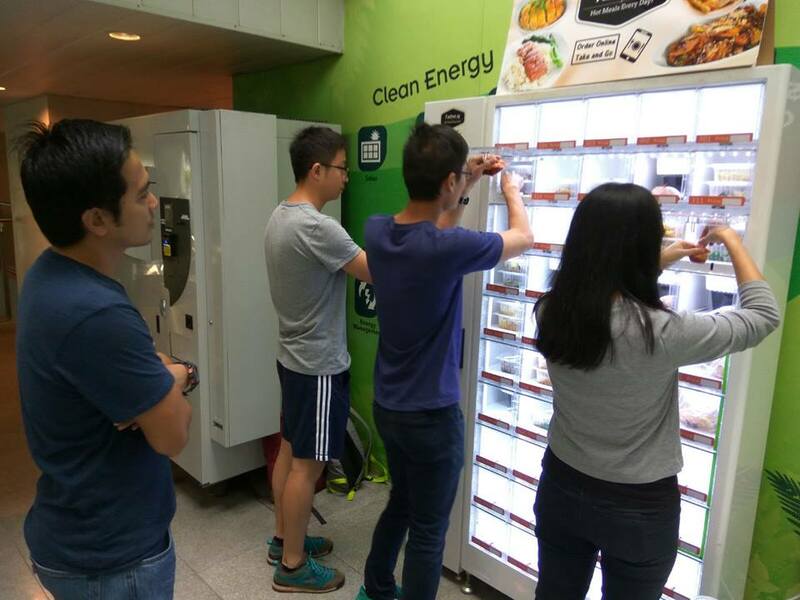 Ravenous customers can place an order via their site before 10:30am, and the meals will be delivered to the vending machine at the business park. The menu is specially curated, with food blogger featured dishes such as the Hainanese Scissors Curry Rice and Thaksin Beef Noodles available. The menu refreshes everyday so like the food, the variety will always be fresh too. Ordering is cut off by 10:50am, and food prep starts at 11. Stalls are at most 20 mins away, and the carrier bags are also insulated to ensure the food will be piping hot when customers collect them after 12pm. 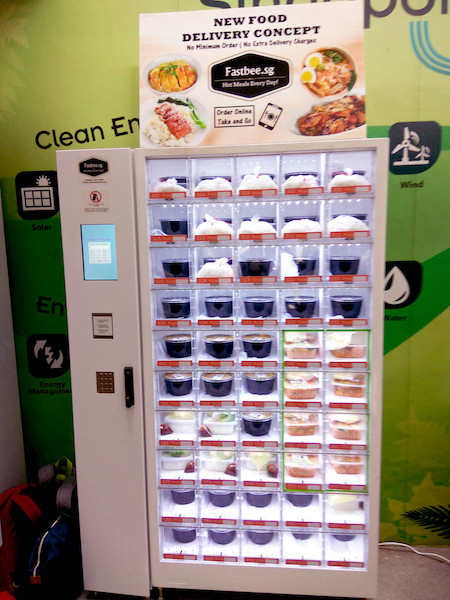 When they first launched in April, there was only one machine at CleanTech One, but founder Kar Kiat plans to have 100 machines dispensing 5000 daily meals by April 2018. Today, Fastbee.sg machines are at Science Park I (The Curie), Science Park II (TeleTech Park), Mediapolis, CleanTech One and GovTech at IMDA. For one thing, it’s clear that the hawkers already love them. A famous bak kut teh store assistant shouted “财神爷来了!” (Fortune God is here! ), when I walked towards their store with my warmer bag at 11 am, an off peak hour for them. Fastbee.sg was founded by Khoo Kar Kiat in early 2017. A mid-career entrepreneur, he made the decision after being introduced to the lean startup model at his job with the Economic Development Board (EDB). 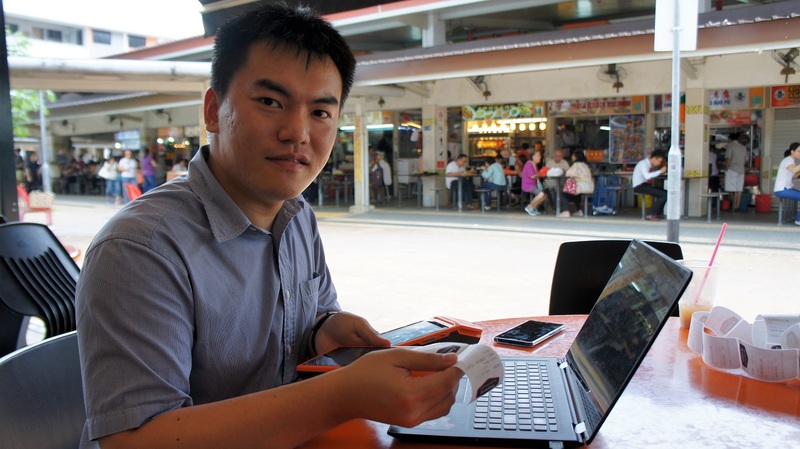 ‘Hawker Food Guru’ Deric Lim left his position as an NTU environmental engineer for Fastbee. He now eats his way to the best meals for the Fastbee menu. Kar Kiat laughs that he and Deric had to eat so much hawker food as homework. Fortunately for Deric, he ran marathons, but Kar Kiat bemoaned that he gained so much weight. Hidayat Rohaizad is their ‘Food Racer’, the logistics coordinator as well as the occasional ‘Auntie Killer’. Hang Zhicheng serves as CTO, and is also the person with the most startup experience (he is also co-founder of housing app HouseTrac). The final member of their team is actually the Fastbeebot, a Telegram bot that prints and manages food orders. Foodpanda and Deliveroo aren’t their competitors, Kar Kiat shares. He concedes that delivery incumbents are here to stay, but “they are fighting each other for delivery outriders and to on-board restaurants with discounts for exclusivity. What the Fastbee team will be focusing on instead will be to survive long-term. “Other hawker delivery startups have come and gone because they try to do too much such as offer too many options. 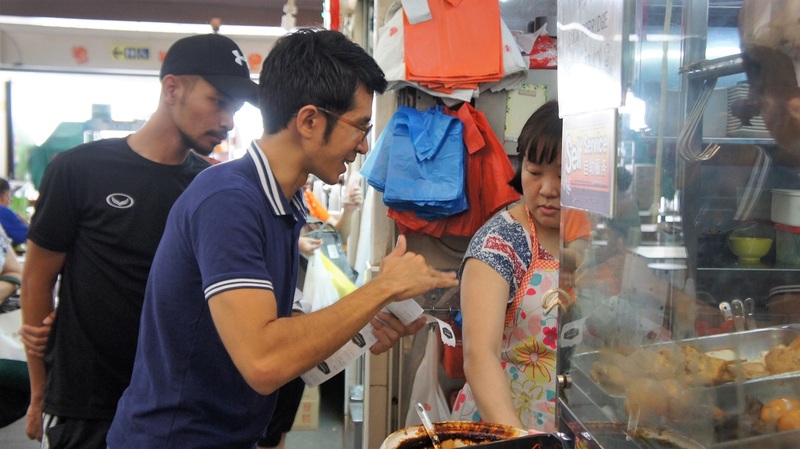 Our focus will be on getting the fundamentals right – the customer, landlord and hawker pain points. The right amount of funding will get me growing at the right pace and co-exist effectively with future competitors. At the moment, there is only one machine at CleanTech as JTC has been very supportive of them, something the team is very grateful for. As of now, the team already has plans for 4 more by May, all also within the Buona Vista area. 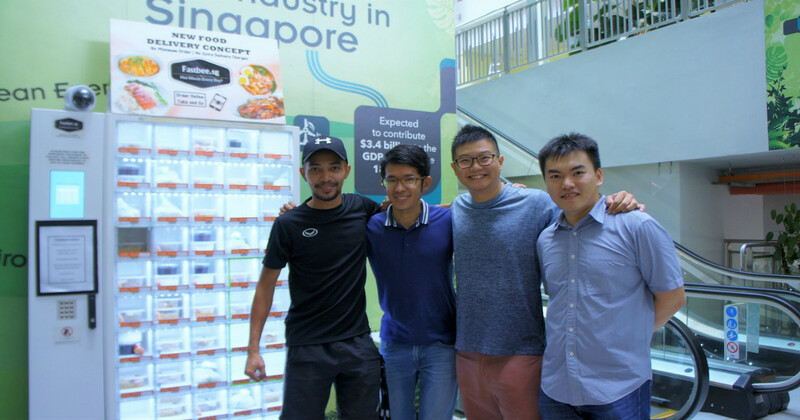 Fastbee.sg was kickstarted to tackle the lack of food options in business parks so that’s where their priority lies. But Kar Kiat shares that they also have the HDB dinner crowd in their sights. “Think Tingkat dinner and we are there to complement them. Our model allows us to keep delivery cost extremely low and unlimited variety of hawker food daily for our customers,” he elaborates. The Fastbee.sg ambition does not stop at insulated machines. “We won’t be able to deliver like foodpanda or Deliveroo, but one day, I believe in using drones,” he shares. The menu for Fastbee.sg refreshes everyday, so remember to keep a lookout for more of their tantalising dishes!